Call me crazy, but I’m currently chewing on the idea of pursuing a PhD after my husband finishes his. It’s a bit of a tough call, but I’ve discovered that I really do love academia, and that nobody listens to me (if I really do know what I’m talking about) without those little letters after my name. One of the main road blocks I face in this area is figuring out how to balance family and career, so I’m taking the year to spend some time pondering the implications of such a choice. As part of this process, I’m revisiting this book – one of my favorites on the topic. I loved it the first time I read it a few years ago, and am enjoying it even more this time. Joy Jordan-Lakes takes an honest, challenging look at faithfulness in calling and passion in all areas of our lives, including career and motherhood. With candor, humor and wisdom, she grapples with how to work out a marriage with two careers, others’ opinions, and the chaos that sometimes comes with the multi-layered life of a working mom. She advocates working as faithfulness to a calling and your family – not just a paycheck. Also quite helpful is her chapter on ‘tools for survival’ where she doesn’t just offer simple how-to’s on making the nitty gritty work, but rather reflections on how to make overall life function well (think: making a weekly grocery list vs. establishing a rhythm of prayer…) To top it off, I frequently laughed out loud at her observations. It all hit so close to home that I even cried a few times as well! 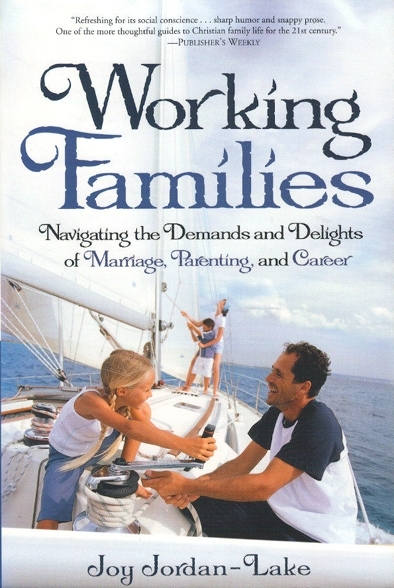 Combining family and professional life is about treating three callings as always connected, never allowing one part to shift without understanding how that will swing the whole ship. There can be something very lovely, you know, about untidy lives. Harsh but True Reality of the Adult World #452: sometimes two good goals are not achievable at the same time. Which means this may be a season for being creative or for compromising. Or for preparing for the next season. For making some tough choices.